Boasts 17 Highway MPG and 12 City MPG! 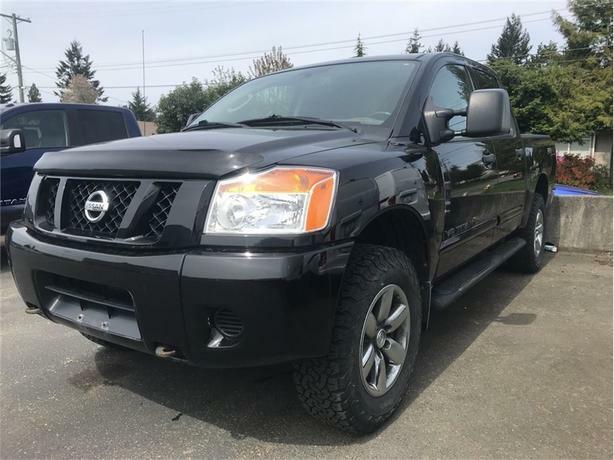 This Nissan Titan delivers a Gas V8 5.6L/ engine powering this Automatic transmission. GALAXY BLACK, CHARCOAL, SEAT TRIM, [L92] FRONT/REAR FLOOR MATS. This Nissan Titan Comes Equipped with These Options Vehicle immobilizer system, Vehicle dynamic control (VDC), Variable intermittent windshield wipers, Transmission oil cooler, Tire Pressure Monitoring System, Stainless steel exhaust, Solar tint glass, Security alarm system, Remote keyless entry, Rear window defogger. Stop By Today Stop by Nissan of Nanaimo located at 3612 Island Highway North, Nanaimo, BC V9T 1W2 for a quick visit and a great vehicle!